I really like Saturday night, cannot wait to see Sly N Robbie back all those great artists! Maybe Shaggy will surprise me too! Looks like a packed program to me. Hopefully Kabaka, and Chuck Fenda are on the small stage to finish Friday. Every year that first night on the small stage seems to be close to if not my favorite show of the weekend. Clinton will close out Friday on the small stage I believe. What an epic Friday night it will be.....again! Yeah, Friday night at the Village stage looks like it will be my favorite part of the weekend! I just really wanted to see Sean Kuti but wont miss Clinton Fearon if that is the case, love the Village stage shows! Kinda wish Friday nights lineup for the Village stage was on Sunday night, although I don't want to miss Tarrus Riley. Not moving from the small stage Friday! except to the press tent! For me, it's Friday Night @ the Village Stage. Sattaday, I'll start my day at the Village stage, but after Jahdan Blackamoore, I'm posting up at the Main Stage. Sunday, I'm bouncing back and forth like the proverbial ping-pong ball. Catch you on the ricochet Walter! Nice, I completely missed the color coding when I posted my first comment. Another year at the small stage Friday for me! Looks like I may have to forego everything after John Holt on Sattaday in order to put in some hard work at the press tent. Not missin Friday for anything! Just saw the whole Riddim Twin tour with Bitty, Michael and Horace so I can get over missing them. A box of tissues will get me through! Only one complaint, if you wanna call it that. Looks like Rebelution after Morgan Heritage, Tarrus, and Barrington? I'm not down with that. skip Clinton Fearon. I'm not down with that. Although Femi was awesome, But Mr. Big Stuff is reggae royalty to me.World music is cool, but reegae is my life! I can catch Kuti on video, would love to see him, but missing Clinton Fearon?! Not happening! Sorry 1 of these greats will be missed by some! Rebelution is getting radio play and selling records in JA ?? Am I reading that right? Same for many of us, I bet. IMO, Seun Kuti is not to be missed, so I'll have to skip Clinton this time... Also, so there is no alternative on the small stage while Rebelution is playing? Saturday I definitely want to see Jahdan and it sounds like Zvuloon Dub System should not be missed, but every act on the main stage I really want to see as well. Will be a lot of bouncing back and forth as others have said. Sunday I want to catch Black Slate, Tarrus Riley and Barrington Levy, curious to see who will be playing on the Village stage during Rebelutions set. SCroots, u read right! And yeah Daniel I agree, ZDS is not to be missed from what I have seen and heard so far. thanks for the info daniel. will clinton be done before seun so we can catch all of clinton's set then head over to the valley stage for the end of seun's set? It has to be Raging Fyah though if they do, right NOMO? Really been digging these guys, also want to get into Black Slate. Why is Rebelution closing the weekend on Sunday on the Valley stage. Assuming they are at the top of the list, it just doesn't sit right. Valley closing on a Sunday? I would guess that Sunday would see Saritah, Carroll Thomson, and Carlton and the Shoes in the morning before Morgan Heritage; Black Slate after MH opposite Cultura Profetica; and Derrick Morgan after Barrington Levy. How close am I, Daniel? I don't believe it for a second. Where is this information coming from? I guess parallel universes are scientific fact hunh. You can show me a radio chart or records sales chart where Rebelution is outselling/ getting more spins than Tarrus Riley in Jamaica W.I.?? [www.dancehallusa.com] Here's one of many. Although over the last year Tarrus has blown up so he may have caught up or surpassed. That link is for an America chart and Americans buying reggae music. Your saying Rebelution is selling more records and getting more airplay in Jamaica than Tarrus Riley, Morgan Heritage or Barrington Levy. The clam is not true. Rebelution is not getting any airplay in Jamaice nor selling records there, much less outselling any of those artists. I get why SNWMF has Rebelution headlining Sunday and it's Smart! Perfect lineup location for them to get that crowd to stay till the end. Works better than headlining Friday or Saturday night for me . They are bigger here in California than the JA artists and that's the business of business, top draw, top slot. Rebelution is also on tour on the east coast Friday and Saturday...I'm thinking Sunday was their only option. I would have assumed they would have been a Friday night headliner like they were in the past if it wasn't for the rest of their schedule. My feet will be planted (besides for dancing, of course) in front of the Village Stage on Friday night, that is one great night to start off the festival! As for Sattaday and Sunday...wow, going to need to be sure to bring my running shoes from my college basketball days in order to catch all those crucial acts on each stage...hopefully Jahdan and Zvuloon Dub System will be done before the main stage starts up. In my opinion, Zvuloon Dub System is a must see show, because not only do they have that classic roots reggae sound, but also because we may not get to see them too often, being that they are from so far away. Anybody not familiar with them, you gotta check out songs like "Lion Of Judah", "Good Sensi", "Freedom Time", "African Drums" and a show-stopper type tune "Going To Zion". And the band Candelaria has a great world sound as well, it would be great to check out at least part of their set. But the main stage lineup on sattaday...WOW. Also, when will times be announced for every artist performance? I got to make sure I got my schedule planned to the second to see as much of every set as I possibly can...!!! Also, when will times be announced for every artist performance? So is black slate performing at the same time as rebelution? That solves my Sunday schedule if so. If dancing is your thing, Seun Kuti is the man for you! I'd say it's nearly impossible to see him perform without shaking yo' booty! Glad to hear I can catch part of Clinton's set before heading to mainstage on Friday. That's kind of what I was hoping for & counting on! I also think Chuck Fenda will be pure Fyah! Good thing I can catch Clinton 2x in the next 3 weeks up here...Seun will be one if the best shows all weekend! For real. That is undoubtably true, but Clinton Fearon is sure to be as well. Not all of us are so lucky as to be able to see Clinton Fearon play on a monthly basis like you Seattle.folks. It is a tough call, but I am planning on watching all of Clinton Fearon and then half of Seun Kuti. In theory, I could catch 3/4 of both performances, but that would require that I leave Clinton Fearon's performance as it is reaching its climax. That is highly unlikely to happen..
What a schedule this year! Perhaps, it is the most balanced and deep lineup ever at SNWMF. It looks like it will be bookended by Kabaka Pyramid and Derrick Morgan. To start with one of the best young artists in reggae and finish with a not often seen legend is perfect and it is why I love this frestival. Thank you SNWMF! 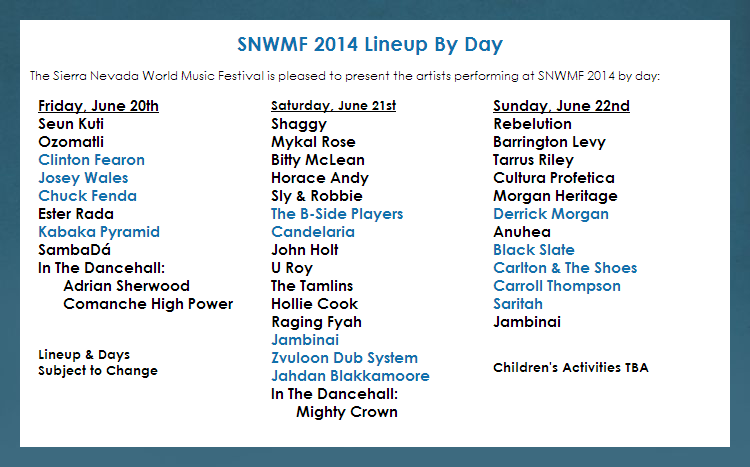 SNWMF 2014 Lineup By Day Announced! Epiphany Artists is proud to present the 21st annual Sierra Nevada World Music Festival taking place June 20-22 at the Mendocino County Fairgrounds in Boonville, California, located in the heart of the picturesque Anderson Valley. SNWMF is a three day music, art and camping festival which features some of the greatest names in world and reggae music, arts, crafts and food, as well as an extensive children’s program. With 2 stages along with a "Jamaican-style" late-night dancehall, SNWMF is a great way to kick off the summer. SNWMF is very "family-friendly" because we offer an extensive array of children's activities, including arts and crafts, dance & music workshops, a festival parade and family and alter-able camping. With its beautiful streaming colors and exotic aromas, the international festival village is an attractive marketplace of food and craft booths created by the collective efforts of artists, vendors, staff, volunteers and ticket buyers that has something to offer children of all ages. The festivities get started on Friday afternoon with a Native American blessing from Pomo elder Clayton Duncan. The Valley Stage then showcases beats from around the globe. First up will be the Salsa and Cumbia sounds of SambaDá, dubbed the West Coast’s hottest Brazilian band by promoters, journalists and fans. Next up will be the Ethio-soul sounds of Israeli born Ethiopian singer Ester Rada. She will be followed by the multi-genre, multi-cultural Grammy winning sounds of Ozomatli who will be bringing their street-party consciousness to Boonville. Nigeria’s Seun Kuti will close out the Valley Stage on Friday night performing with Egypt 80, the extraordinary band first fronted by his renowned father, the late Fela Kuti. Fire Dancers will perform under the moonlight in front of the Valley Stage following Seun Kuti. Reggae music will be in full effect on the Village Stage on Friday night starting with the ‘reggae revival’ sounds of rising star Kabaka Pyramid along with his back-up band, The Bebble Rockers. Known as ‘the poor people’s defenda,’ Chuck Fenda will be making his first visit to Boonville. Widely regarded as one of the best DJs in Jamaica when dancehall took over the reggae scene in the early ‘80s, Josey Wales will be making his Northern California debut at SNWMF. Clinton Fearon, aka the “backbone” of The Gladiators, will cap off a great night of music on the Village Stage. Friday night’s dance hall starts with Comanche High Power laying down some serious grooves. The dance hall will be hopping until the wee hours of the morning with the founder of England’s On-U Sound record label, Adrian Sherwood whose set will also include an appearance by Josey Wales. The first day of summer starts with Solstice Yoga under the shady redwoods of the Village Stage followed by SNWMF’s traditional roots reggae Saturday lineup. First up: Jahdan Blakkamoore whose music has been described as “Urban World Music with a Message.” Next will be Zvuloon Dub System, Israel’s leading world-reggae band that emerges from a multicultural middle-eastern music scene and sings in both English and Amharic. The favorite of children of all ages, Asheba, returns to SNWMF early afternoon followed by cultural dance troupes and the festival parade SNWMF then hosts the world-wide critically acclaimed Korean band, Jambinai, who will take to the stage with their unique brand of music. They will be followed by the distinctive sounds of CumbiaDub courtesy of Oakland’s own Candelaria. The Village will be rocking when The B-Side Players lay down their own inimitable brand of Latin global funk on Saturday night. Jamaica’s Raging Fyah is an authentic, soul-filled, roots rock reggae band with a fresh contemporary flare that will get things rolling on the Valley Stage on Saturday. West-London’s Hollie Cook then makes a return to Boonville and will perform songs from her brand new album, “Twice.” Next up will be three artists that personify reggae’s golden era: The Tamlins, one of the best harmonizing trios to emerge from Jamaica, will be making their Northern California debut, followed by U Roy, a founding father of Jamaican DJ music, and John Holt, who was a rock-steady superstar as a member of The Paragons long before he embarked on his successful solo career. There are perhaps no two persons more responsible for reggae becoming internationally known than Sly & Robbie Having performed together on over 200,000 recordings, the “Riddim Twins” will have Anderson Valley dancing the night away on Saturday evening. In addition to their own set, they will also back the legendary Horace Andy, as well as British singing sensation Bitty McLean. Sly & Robbie’s set will culminate with a return performance by Mykal “Grammy” Rose. Closing out the music on the Valley Stage will be Shaggy, the only certified diamond-selling dancehall reggae artist. The dancehall will be rammed on Saturday night when Japan’s own Mighty Crown takes to the turntables. Sunday’s musical festivities begin with ‘vintage music’ compliments of Carlton And The Shoes and Derrick Morgan. Carlton, who mentored his younger brothers Donald and Linford Manning of The Abyssinians, had a huge hit with “Love Me Forever” in 1968 before going on to be a resident musician at Studio One. Derrick Morgan was a member of the classic ‘first wave’ of Jamaican ska artists but became the unrivaled “King of Ska” by 1968, and the festival is pleased to have him returning to Anderson Valley. Sunday Music on the Village Stage continues with Australia’s very own Saritah whose performance will include selections from her new album “Dig Deep.” She will be followed by Carroll Thompson, whose hit “Hopelessly In Love” established her as one of the UK’s finest female vocalist and who is affectionately dubbed the "Queen of Lovers Rock." England’s renowned roots rock reggae band Black Slate, that helped put the British Reggae sound on the charts in the 70s and 80s, will be making their Northern California debut when they close out the music on the Village Stage on Sunday night. Jambinai utilizes native Korean instruments that include a geomungo, piri, and haegeum to create a very unique sound that will get things started on the Valley Stage. Following them will be the newly reunited “Royal Family of Reggae” Morgan Heritage who have established themselves as the premier live group on the reggae circuit. Anuhea then blends engaging lyrics, acoustic soul, pop, rap and reggae into a style that has earned her a reputation as Hawaii's #1 female artist. Hailing from Puerto Rico and making their first appearance at SNWMF, Cultura Profetica sings with the voice of the people, and transmits the heartbeat of the earth. Tarrus Riley, whose new album “Love Situation” is making big waves, will follow, backed by the Black Soil band that includes legendary saxophonist Dean Frasier. With a career that spans five decades, Barrington Levy will be returning to SNWMF to ‘nice it up’ once again. The powerful sounds of Santa Barbara’s Rebelution, a group that has developed into a front-runner for grassroots, independent and tour driven music, will be bringing down the curtain at the SNWMF 2014 Valley Stage. TICKETS ON SALE NOW! Advance 3-day music tickets are $170 via mail order, online and at independent ticket outlets. Limited on-site camping is $75 per car or SUV. RV and Bus camping is sold out. Camping is not included in the 3-day ticket price and must be purchased separately. On-site vehicle camp will sell out in advance. Limited walk-in camping will be available on a first-come, first served basis. 1-Day tickets: $60 for Friday, $75 for Saturday, and $65 for Sunday are available via mail order, online and at select independent ticket outlets. To mail order: Send check/money order to SNWMF 2014, P.O. Box 208, Ryde, CA 95680. On-site camping is $75 per car/SUV and is available online only. For additional information, and to purchase tickets, please log on to www.snwmf.com. The Sierra Nevada World Music Festival is dedicated to nurturing a world family peacefully united in celebration of the universal spirit of music. Come celebrate with us! Josey Wales in the dancehall on Friday night!!!!!!! I really like how everything is shaping up! Love that Black Slate will be playing on Sunday night when Rebelution is playing, really looking forward to Black Slates set. Thanks Daniel for sharing that article, gave good insight on what to expect. Is it June yet? Saturday...........The Tamlins followed by.....U Roy & John Holt back to back. Extra nice. Followed by the Taxi Gang.....am I dreaming? Daniel, one quibble. This is not Chuck Fenda's first appearance at SNWMF. His first appearance was in 2005. In pretty sure I saw chuck fender preform with sly & Robbie and cherlynne Anderson her first year out. Am I wrong? I was pretty irie that day. I meant to type Cherrine. 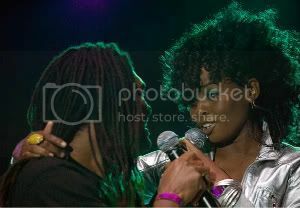 Jahsiah, Cherine performed a duet that year with one of the artists that came with her and sly and Robbie and brought 1 happy man up on stage with her but no chuck fenda that year. Although I think Rebelution has not really improved since their first LP, I don't mind them as much as the other Cali type bands. But say what again ----- is it really true that they are getting a fair amount of air play, and more importantly, CHARTING in Jamaica ? Thank you for that response and no to not pick. However I'm pretty sure it was this guy who performed with her. Respect. Chuck Fenda always a good show every time I seen him. Favorite was 05 in Angels camp with Richie Spice. He was more dancehall artist back in the day but Bounty dubbed him poor people defenda in 2003 and mostly roots & culture tune since then. Throwback status on that one. Although my cameo was during "Good Love." The singer joining her on "Coming over tonight" that year was Peter Gayle, who's a tough singer in his own right. Rebelution gets 0 airplay here, and there is no generally accepted JA Sales chart (because really, the only music that sells in JA is either foreign R&B, Gospel, or bootlegs on the street anyway). Thanks for confirming that Dr. Suess --- had a feeling this Rebelution JA/chart/air play 'report' was not making any sense. Who knows though, maybe there really is another chart out there ??? Who knows though, maybe there really is another chart out there ??? This seems to be the most accepted JA chart, they claim the sources are Sound Systems, Record Shops, Night Clubs & Radio Play. I do not check it very consistently, but I have never seen Rebelution on there and do not expect to. I will def be getting to SNWMF early on Friday so as not to miss a second of Kabaka's set. Looking forward! Uh, I think we are all super spoiled by this fest.....THANk YOU!